If you’re from Vancouver, you know about rain in all its variations. Even if we’re talking about the driest month on record, you can be sure to see some of the wet stuff at one point or another. Of course, with the weather we get in the southeastern corner of British Columbia, roof leaks are a common problem for home owners and roofers reap the benefits. Unfortunately, during the rainy season (which you might argue is year-round in this locale), roofers often can’t keep up with demand and home owners may be left scrambling to control a leak until professional help arrives. So, what do you do? First things first, you absolutely must manage the leak from the interior of your home. Ultimately, your goal will be to reduce damage to your property and your belongings so that you can minimize the associated costs of the leak. Typically, water will build up in the ceiling until it finds an escape route. Water will usually take the path of least resistance which means leaks often drip from light fixtures or other ceiling fixtures such as fans. To prevent a leak from spreading, try to poke a hole at the wettest point of the leak or where you find water bulging below the paint. By creating an exit point, you can likely contain the leak and collect the water with a bucket while minimizing damage to your ceiling, walls, and fixtures. After you’ve created a drainage point, you want to try to find the water’s point of entry. This can be tricky, but the best place to start looking is your attic. 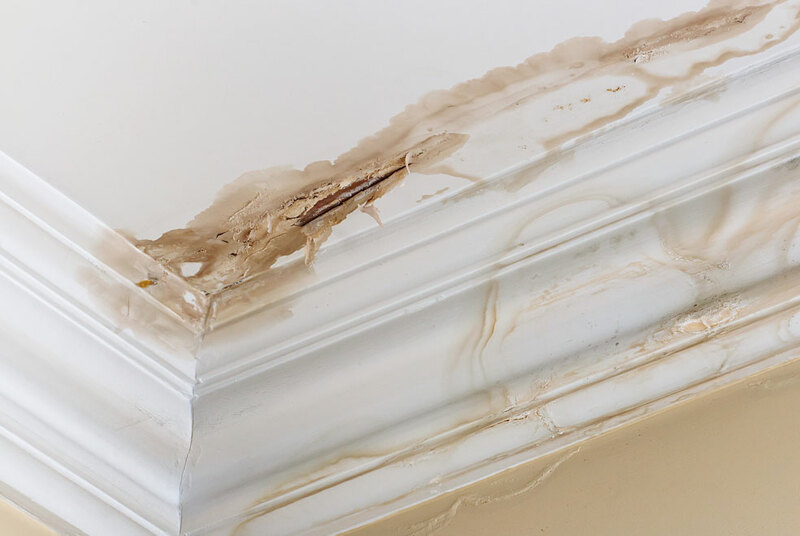 Often, the leak from your ceiling and the entry point in your attic will not line up; so, you’ll have to be diligent in searching for the entry point. Consider the slope of your roof as water may travel from a higher point on the roof but enter your home at another spot at a lower elevation. If you have successfully located the entry point, you can try patching the leak with roofing cement or tape as a temporary solution until your professional roofer is available. You probably do not want to venture out on your roof unless you have the necessary safety equipment, skill, and confidence; however, if you are comfortable getting out on your roof, cover the leak location with a tarp. The tarp should cover from a point at the top of your roof and extend past the leak. You can secure the tarp with lumber (2×4 strips work well), but take care to fasten the boards without piercing your roof and creating new leaks. Remember, these are only temporary solutions to a leaking roof and you’ll need to have a roofer complete proper repairs. Ideally, you’ll have your roof inspected at least once a year so as to avoid leaks in the future.